I bought these colourful cookies at a cookie shop in Muar. Before the Mid-Autumn festival, my wife and I went to Muar to buy moon cake. When I stepped into the cookie shop, I was surprised to see these colourful cookies displaying on the shelf. 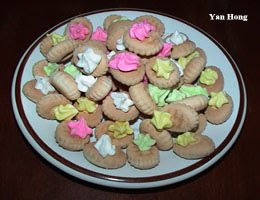 These colourful cookies reminded me of my childhood. The cookie is divided into two parts. The lower layer is crispy biscuit and the upper layer is a nibble of sugar. When I was a small boy long ago, I used to eat the lower parts of the cookies first and then enjoyed the sweet nibbles of sugar later. Same as reading Crayon Shin-Chan, after eating the colourful cookies as if the time had been rewound to childhood. It's so coincidence. haha... make me recall of my childhood..